The Oasis by Clear World Resorts is an extension of the very same philosophy that made Clear Cafe Bali a trusted and highly frequented restaurant with hundreds of thousands of customers passing through our doors over the past 7 years. Clear's attention to detail, from the way we have designed our menu to the ambiance created through our design and build skill sets, all will be utilized to their fullest as we implement our plan for The Oasis Eco Resort. Clear Cafe is based on the Island of Bali and has become a known and trusted brand in just 7 years. Our flagship restaurant is located in Ubud and has emerged in a very competitive market to become what is arguably one the most successful and beloved eateries on the Island. Our second location is in the plans and permits phase and will soon break ground April 2017 in Canggu, Bali. With endorsements from world renowned professional authorities and celebrities such as David Wolfe, Michael Franti and Linda Garland Clear is well positioned for ongoing success. Clear Founder, Brett Black, a 15 year resident of Bali, is fluent in the Indonesian language and intimately familiar with the culture, which provides for building strong and lasting relationships with Indonesian business partners as well as forming valuable strategic alliances. 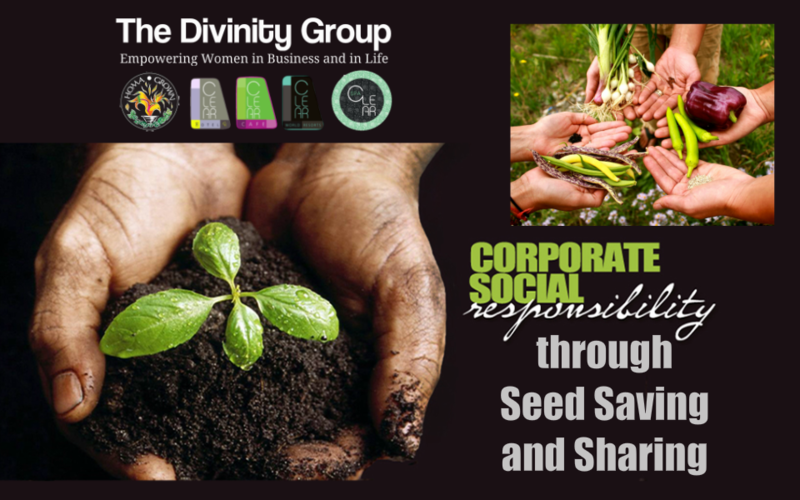 He recently initiated the formation The Divinity Group which is an organization committed to empowering women in business and in life, which stands at the core of our CSR and opens the door to many new opportunities that will add value to our already successful brand and the ethos with which we conduct our business. Clear's strong business brand which includes Clear Cafe's, Clear Hotels, and Clear World Resorts operate under the ethos of, "what is good for people is good for business" which together represent a full range of Corporate Social Responsibility talking points. Clear World Resorts will extend these skills sets and philosophical ethos to the development of The Oasis with far reaching implications for our planet, as it will showcase to a global audience, that which is possible when like minds come together to implement Anthropocentric Eco Solutions in a resort setting of divinely inspired beauty and purity. The Islands of Indonesian Archipelago have some of the fastest developing islands in the world. These Islands are known for their world renowned surfing and scuba diving as well as unparalleled beauty and wildlife diversity all within an unspoiled natural environment. In point of fact, the global ocean currents and trade winds provide for protection from the vast majority of all kinds of pollution produced predominantly in the northern hemisphere where 90% of our planet's population resides and therefore The Oasis will enjoy the advantages which this protective isolation offers. For these reasons and others many of the better known Indonesian tourist locations over the past several years have seen land values increase by 100% per year. We would like to direct your attention, however, to a place where the timing and current market conditions make it possible to participate in an extraordinary opportunity prior to a time which will soon see similar price increases as have already been seen in Bali, Lombok and the Gili Islands. Imagine discovering Bali today at the price points of decades prior. This is your opportunity now at hand, as Clear World Resorts presents, "The Oasis". Located just 25 minutes by air from the famous Island of Bali, The Oasis is covered with tropical jungles, emerald lakes and magnificent coral bays. Aquamarine colored Ocean waters touching pristine white sand beaches making it ideal for all of the recreational activities we will be providing. Activities like surfing, diving, snorkeling, jungle trekking, fishing, canoeing, sailing, and horseback riding are all available at The Oasis. Today the opportunity exists for you to participate in our vision and to benefit from our business plan and proven design and construction expertise. Our resort will include guest accommodations for 200 people, an airport, a Clear Cafe© Restaurant, a fully equipped Health and Healing Spa Center. This will be a wellness center that will include Ayurvedic consultations, holistic therapies, as well as detox and health re-building processes and protocols. Ayurveda, which literally means the science of life (Ayur = Life, Veda = Science/knowledge), is an ancient medical science, which was developed in India thousands of years ago. It is believed to have been passed on to humans from the Gods themselves. Ayurveda evolved into what it is today from sages who recorded these methods into ancient treatises, known as the Vedas, dating back five thousand years. This ancient Vedic literature includes valuable lifestyle codes that if followed create and maintain health, as well as greatly aid in fighting illness and aging. These healing art methods include massage, herbal medicines, diet control and exercise, as well as detoxification, rejuvenation and anti-aging therapies.as well as a fully operational Homa Organic Farm producing a wide variety of organic produce. It is in this setting and culture that you will find your own managed and fully maintained residence complete with beachfront access and a full range of 5 Star activities mentioned above. Clear World Resorts has secured on this incredible ocean-front opportunity and we are now offering limited partners an exclusive place within our Resort starting from 25K USD per 10 x 10 M plot. Comparatively similar plots proximal to the beach on Bali are presently selling for between 300k and 400k USD. 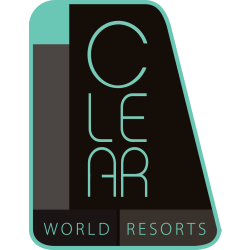 Your investment is 100% Guaranteed by Clear World Resorts; meaning that should you for any reason require your money back Clear will return your investment in full within 30 days of your written request, no questions asked. Your investment in plots will be transferable to a 3rd party provided they meet the same criteria as the holder did when admitted to the community. 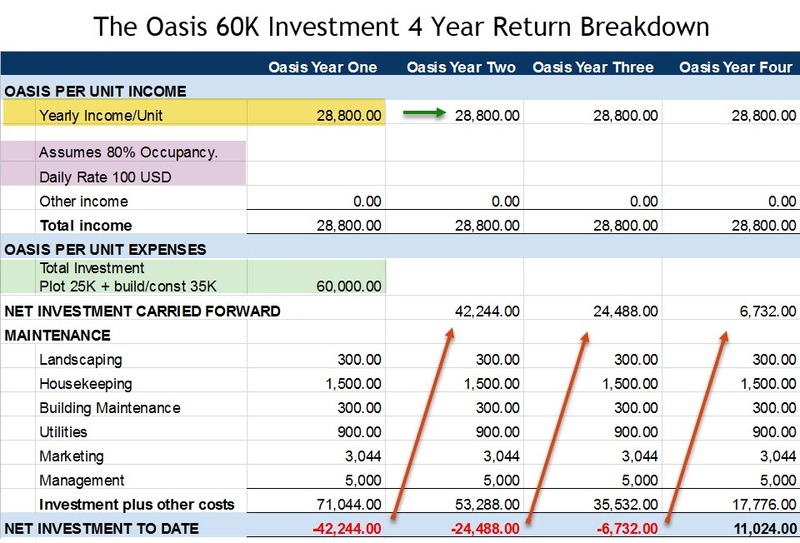 Any capital gains realized in the transfer will be shared with The Oasis in an 80% / 20% split. 80% going to the plot holder and 20% to The Oasis for maintaining and developing the property, making the market and for administering the LTLH transfer legal work. For the first 100 subscribers to this Phase One Development, Clear Eco Resorts will build the plot holder's dwelling at our cost using our proven designs estimated to be no more than 35K depending on the options chosen by you. It will include the following amenities and fixtures: one master bedroom with full bath, living area and kitchenette, landscaping and natural privacy fence grown from indigenous trees and shrubs. This will provide a real sense of privacy within the residential area of the resort campus. All plot holders are required to build an approved design living quarter on the 10 x 10 plot within 3 months of executing our partner agreement with an incentive to begin sooner than later. We allow those partners who break ground and build first to receive the first choices on a first-to-build-first-to-select their residential location within the resort residential area. Plot Holders will have a profit share arrangement with The Oasis for year round property maintenance and management while not in residence. This will provide the plot holder with a passive income source and the absence of property maintenance issues so important to protecting their investment over time. Rental income derived from the daily rates will be shared back to our partners: 60% for the member partners, and 40% for The Oasis for the first 4 years to help accelerate the pay down of the investment incurred. 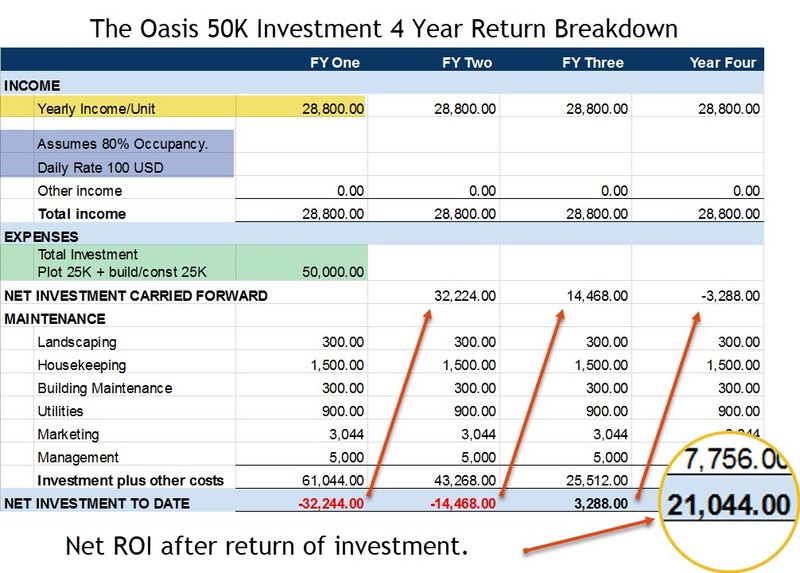 In year 5 and onward, share percentages will reverse with 40% going to the member partners, and 60% payable to The Oasis as compensation for management, marketing, and maintenance. All founding member partners will also be granted special privileges with regard to Clear Cafe Restaurant and Grocery Store pricing. With a standing 10% discount as our preferred member for the lifetime of their residence. This discount will be allocatable to visiting friends and family staying in the partner residence by means of a loyalty card. Inter Island Flights will also be provided at a 10% discount for all Partners. Limit 4 round-trip flights per year and will not be transferable to visiting family or friends. As we begin this development, the strengths we can cite are many. We have an established and profitable brand that will showcase our design/build skills. We have a credible track record that is endorsed by some of the most prominent and well know authorities in the areas of health and well-being and design architecture. These endorsements together with our well-established customer base provide us with a real advantage in reaching our audience with this value added offer. Additionally, on the ground, we have close ties to the indigenous community of Bima people with whom we will be working to build and maintain The Oasis. In the area of finance, we have an advantage having formed and nurtured a close relationship with our investor group for whom we are a strong and loyal advocate. Finally at the core of our offering is our product/service which is arguably some of the most unspoiled and pristine properties to be found anywhere in the world. This in itself, particularly when combined with the many other strengths we have herein sighted represents a major strength that makes everything else we do bigger and more attractive from the standpoint of value.  Our Marketing Strategy is simple and straight forward. We intend to harness the very large and constantly growing customer base of Clear Cafe located in Ubud, Bali and very soon in Canggu, Bali. In the Ubud restaurant alone we see an average of 10,000 unique visitors per month. Additionally, we have a mailing list of 10's of thousands of customers and fans on social media which we will leverage using brochures and online marketing presentations. This will enable us to reach our audience in powerfully effective ways that will incentivize their further sharing of our content and value added offers to extend our reach even further. We also plan to leverage the followers and fans of some of our larger patrons, many of whom are well know Yoga teachers with large followings to reach an even wider audience than that of our own which will assure that we keep the marketing funnel full at all times with new resort prospects interested in attending the many Yoga Retreats as our guests at the Oasis. These are market segments that represent the perfect prospects for our offer due to their local status and proximity to our location. These are people already on vacation or living in Bali and have the time and opportunity to engage with our timely offers. Our goals and objectives are first and foremost to build a great resort that genuinely reflects our ethos of, "what's good for people is good for business." In this regard, we will not compromise. So it is important that we get it right. We are only looking for 100 investors for our first phase of financing and we want those investors to fully appreciate what our vision is and in so knowing really want to be a part of the project. This is above all other considerations very important to us. Ideally and practically speaking we see our investors coming from two sources that are, in fact, quite close to us already. The first being Clear Cafe customers. The second being close friends and fans of those same customers. In summary, we believe that our vision is in lockstep with our times: Building an Eco-Resort community and making it available to like-minded people who also share our values is an idea many will want to share and participate in. We are blessed and honored to have all the elements needed to see this project forward. We hope you are able to recognize clearly the value of our proposition in the many ways it can provide benefits to you, both in financial terms and perhaps, even more importantly, in the many other ways living a healthy and empowered lifestyle will greatly benefit you for the rest of your days. This document relates to Clear World Resorts proposed development of The Oasis Eco Resort in the Indonesian Archipelago on a timetable between 2017–19. Clear has acquired 2 adjacent parcels of land to create a 4-hectare site – of which the entire 4 hectares are currently beach front lands zoned for our resort. Clear has obtained commercial re-zoning of the site to construct buildings comprising 100 residential Eco-Dwellings and 5 commercial premises. With development at an all-time high for the region, many new opportunities are being presented for resort development. The Bima People are welcoming our plan for an Eco Resort and are supporting this development with an understanding that there will be jobs and economic benefits to their community. They are also keen to learn and observe and benefit from our water procurement and treatment technologies, as well as our food production methods which are both a part of our Corporate Social Responsibility scheme. As the growth of tourism and the subsequent development continues in the region especially on Bali and nearby Lombok the opportunity exists for outlying projects that are less encumbered by the already inflated land prices and the accompanying congestion we see in communities like Ubud, Seminyak, Kuta and other Balinese communities. Clear World Resorts will commence construction of buildings comprising 100 dwellings plus 6 commercial premises comprised of a Clear Cafe Restaurant, Clear Express Grocery Store, a Banquet Hall, a Concessions Office including a Beach front Yoga Shala and a Health and Holistic Healing Center once 50% of the 100 plots have been sold. 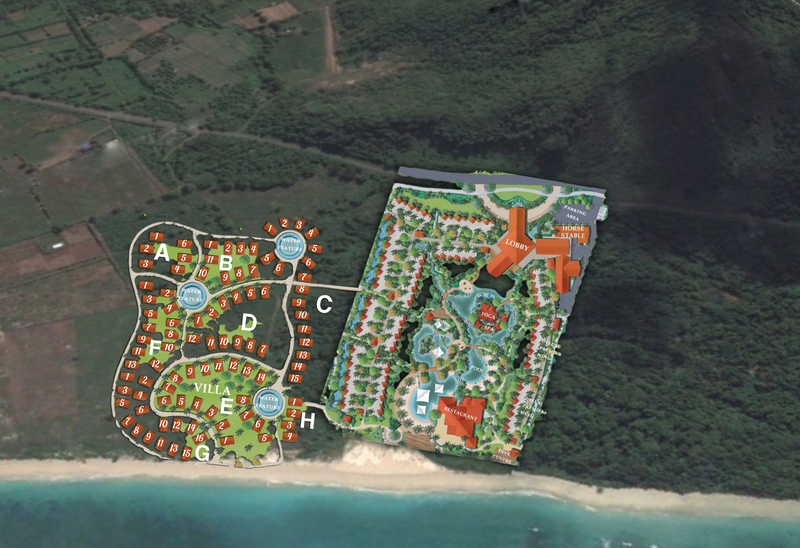 Our 4-hectare parcel of beach front property is perfectly appointed for the Eco Resort we are building. Adjacent to The Oasis on our northeast quarter is a National Park comprised of pristine long-standing forest that offers both protection from the potential for encroachment of other development and also a wonderful opportunity for jungle trekking activity. 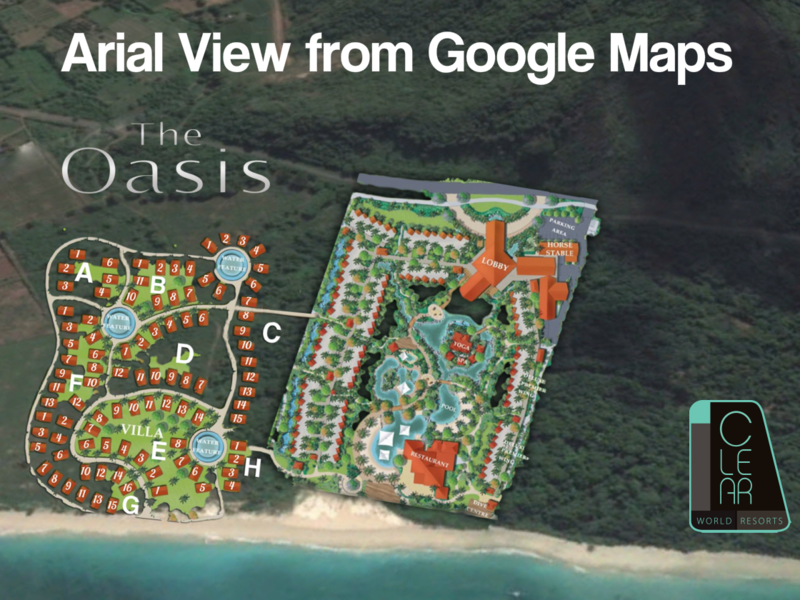 For those who want to know the exact location of the Oasis Eco Resort you are invited to participate in a call with Oasis creator Brett Black where all your questions will be addressed and more information not covered in this Business Plan will be shared. The land is currently zoned for commercial and residential premises and is situated adjacent to a national forest, assuring that our resort remains untouched by potentially unattractive development. It will also assure our privacy well into the future. The Oasis Eco Resort is located in the Indonesian Archipelago approximately 220 kilometers due east of Denpasar Bali, Indonesia. By Seaplane it is a short 25-minute flight to our destination and by commercial jetliner. (many airlines including Lion Air, Garuda Indonesia, Singapore Airlines) Shuttle buses will be provided by The Oasis for your convenience, comfort and safety. The Oasis Eco Resort will be located immediately adjacent to one of the most famous surf spots in the world. Known for its perfect wave conformations perfect for both advanced and novice surfers. Also nearby is a well known and highly frequented scuba diving location that is among the very best dive spots to be found in the Island chain. White sand beaches stretch for 20 kilometers west touching emerald ocean waters with little or no commercial development anywhere to be found. A nearby private airport provides for convenience as it only a 10-minute horse and buggyride away. We are also fortunate to have located nearby a hospital that is quite modern and well equipped to serve the needs of the western personnel about 20 kilometers north of our property. This hospital is well equiped to treat both the outpatient and inpatient needs of our community should it be necessary. Horseback Riding, Jungle Trekking, White Sand Beach Yoga and Meditation Retreats, Bio-Dynamic Gardening Classes, Scuba Diving School, and Dive Excursions, Kite Surfing, Wave Surfing, Canoeing, Catamaran Sailing, Wave Runners, Paragliding and Tandem Skydiving experiences can all be had at the resort. One of the most favorite and frequented dive spots is a short zodiac ride away the Oasis and one of the most well-known instructors of Kiteboarding Jason Wolcott will be offering our guests instruction. State of the art Clear Fox Waste Water Treatment Plant will conserve and recycle our water for use on our organic farm and for use on our residential landscape throughout the resort. As crystal clear groundwater is in plentiful supply, we will sink numerous wells sufficient to meet the needs of the resort. Scalable waste water treatment using a containerized bio-film media process that can be scaled to meet our needs well into the future as additional facilities and guest accommodations are added. This unit will provide water for all our landscaping and farming requirements while also supplying a safe and effective bio fertilizer for our landscapes. The Organic farm will not use this as it will be operating under a strict Ayurvedic protocol that uses bio solutions derived exclusively from cow manure and special ash. Our agreement with you will be in perfect alignment with our Ethos in every way. Once again, "What is good People is good for Business", which means what is good for you is good for us all and we have structured an agreement that accomplishes this perfectly. Under the terms of our Long Term Lease Hold (LTL) agreement, you will enjoy greater flexibility and legal transfer rights meaning that you will be able to transfer this contract to an heir or another should you wish to in the future. If you wish to sell your contract we will assist you by making the market and facilitating the transfer. We will be responsible for maintaining your LTL property in your absence and you will share in the income it generates providing you with a quarterly passive income stream. This is much more advantageous than would otherwise be possible under the present legal system in Indonesia and in so doing we all save money, time and other potentially cumbersome legal entanglements, compliance issues and other restrictions imposed by Indonesian Foreign ownership regulations. By doing business with Clear World Resorts directly acting as a proxy on your behalf you enjoy the best of both worlds minus the headaches and hassles. We eliminate the third party from our relationship and forge a Holy Alliance directly with you as our partner in this vision. This is the way those who have lived in Indonesia for decades operate successfully and provide for a Clear way forward while minimizing the fear based entanglements that unnecessarily complicate a simple arrangement between two contractual parties in agreement. You are cordially invited to participate in a one on one call to answer any and all questions you may have with the Oasis founder Brett Black. Simply send us an email to ( ClearWorldResorts@gmail.com ) and let us know when and we will initiate that call. We also address the question as to the specific location of the resort at that time as many of you are asking. Although Bali is Indonesia's premier destination there are signs that over development and the resulting congestion may be affecting its desirability. With the increase is 4 and 5 Star rated accommodations it is also clear that competition is heating up as several hotels have already introduced lower rates; however, this is not representative of the general market condition nonetheless from our supply projections, competition is anticipated to heighten. The amount of budget hotel development in Bali is low compared to the star-rated hotels. 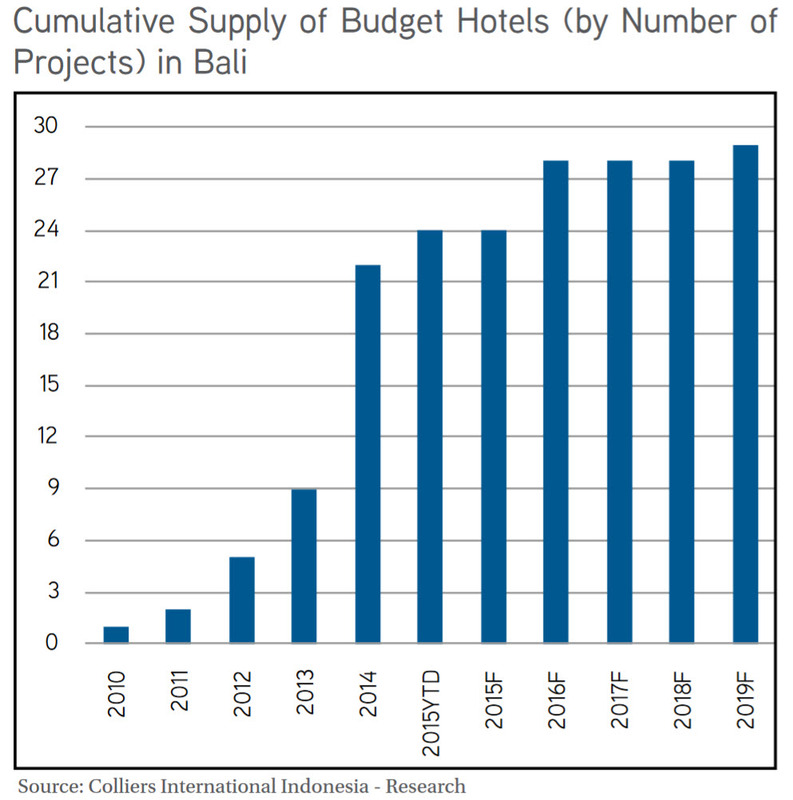 We revised the size of the budget hotel supply in Bali to 2,794 rooms at 24 hotel projects. We anticipate three more new budget hotels which are expected to be in operation by the end of 2015. 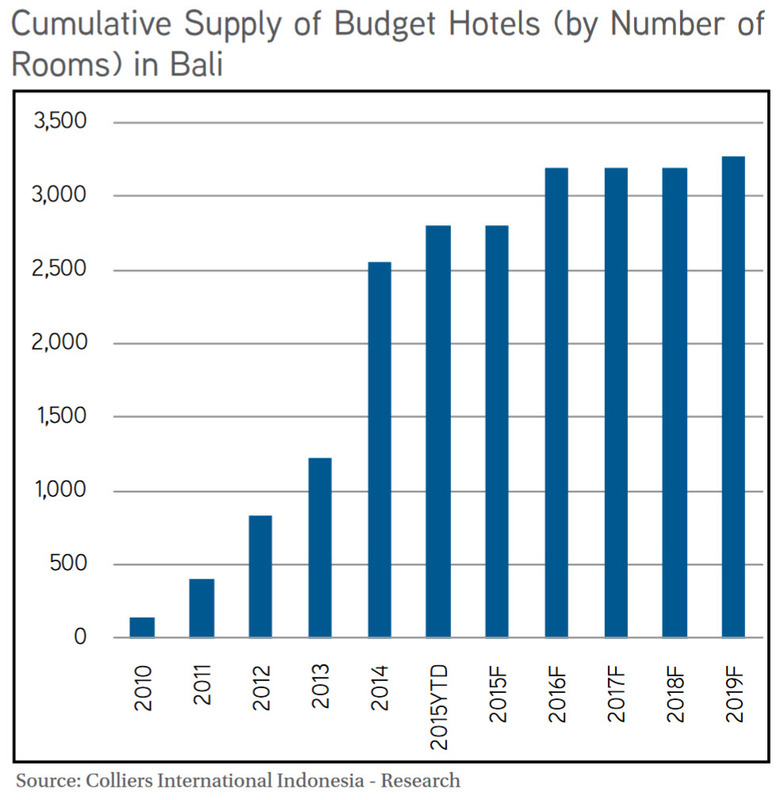 This will add around 476 rooms to the budget hotel supply in Bali by 2019. 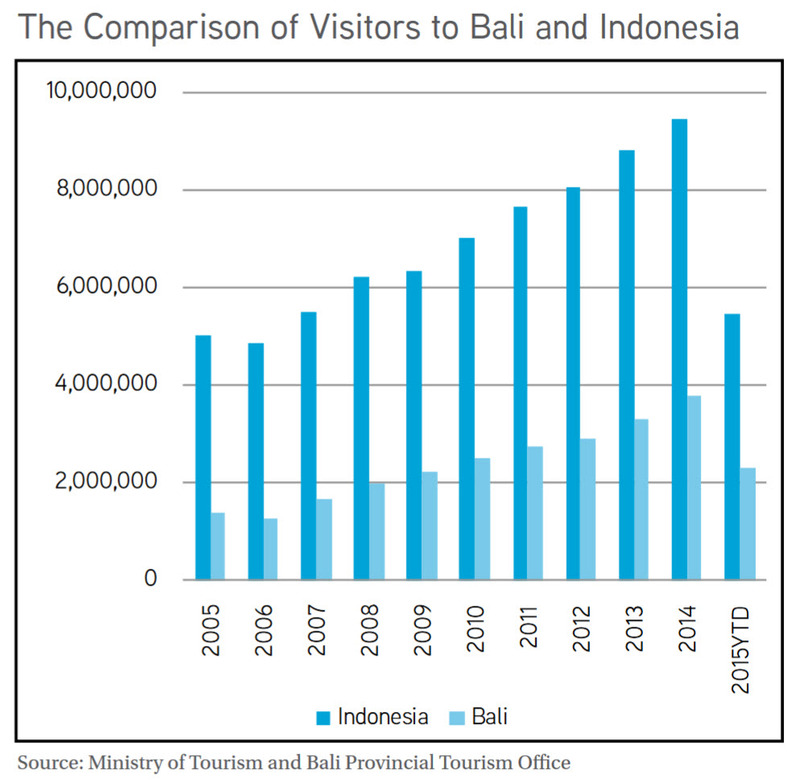 Still quoting data from the Bali Provincial Tourism Office, there are several markets experiencing a downturn in number. The most significant is Russia. Since 2011, the number of tourists from Russia has been dwindling by -9.09%. Similarly, the number of British tourists to Bali has also been shrinking over time. In short, every market looked weaker during 2014 - 2015YTD. Despite not having figures for all of 2015, the tourism market is becoming challenging in Bali. The reasons might be complex, possibly because of domestic matters like lowering spending in each of the countries or because tourism in Bali itself is becoming less attractive compared to other regional destinations. The Bali tourism market has been predominantly propelled by the domestic market for several periods during the good and bad times. The opening of new direct flights to and from other areas helps fuel the amount of domestic tourist spending in Bali and bodes well for inter-island competitors such as we are proposing with Clear Eco Resorts. As the main attraction of Indonesian tourism, Bali saw several new hotels ready for operations while some of the old hotels were re-branded to improve their image. During 3Q 2015, three new 5-star hotels opened to the public. In Ubud, Ritz Carlton opened their second hotel in Bali called Mandapa, a Ritz Carlton Reserve. Providing 60 suites and villa, this hotel has increased the competition among 5-star hotels in Bali. Local hotel operator Padma, also opened another property in Ubud, called Padma Resort Ubud. Padma Ubud provides 149 rooms for the public. Innaya Putri Bali, which was previously called Grand Inna Putri Bali, is adding 460 rooms to the hotel supply in Bali. 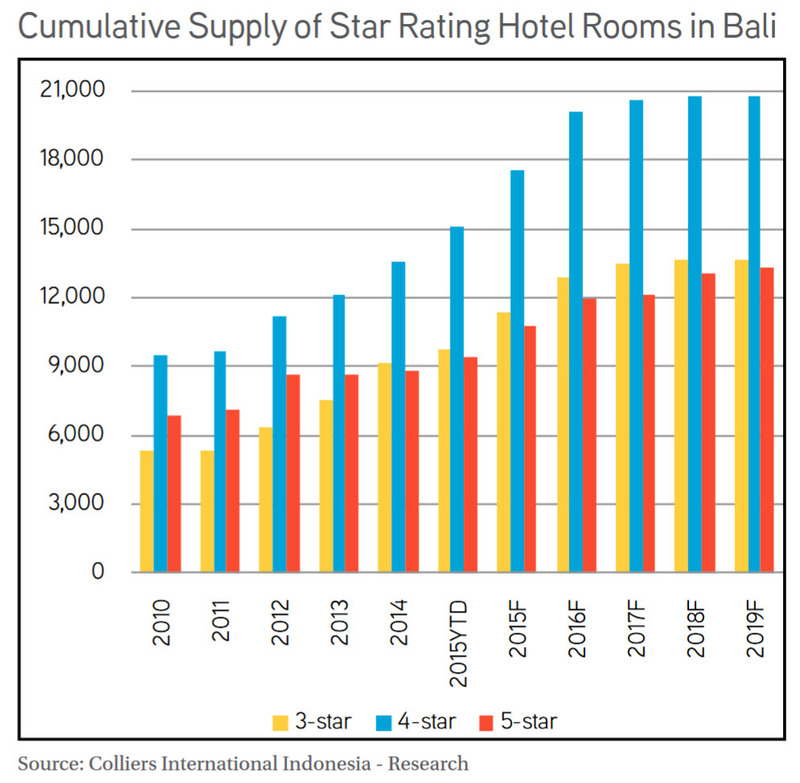 Based on Colliers’ database, there are 16,965 5-star hotel rooms in Bali. In the 4-star category, the market witnessed an additional 80 rooms at Sadara Boutique Beach Resort Bali, which is located in the Tanjung Benoa area. Other than that, Starwood Group expanded their business with the new Four Points by Sheraton in the Kuta area providing 185 rooms to the public. Another new 4-star hotel called Rumah Luwih, located in the Gianyar Luwih, located in the Gianyar area, added 75 rooms to the market. By 2015YTD, there are 20,661 rooms in Bali in the 4-star category hotel supply. The moratorium on new hotel development in southern Bali issued by the Bali Provincial Government has so far not being fully implemented to tackle the region’s over-development. Nevertheless, local government banned one hotel project in Nusa Dua area due to incomplete documentation.being fully implemented to tackle the region’s over-development. Nevertheless, local government banned one hotel project in Nusa Dua area due to incomplete documentation. Since early 2015, the ADR for star-rated hotels has been gradually on the ebb. This trend is evident since 2013 for all categories of hotel. The QoQ figure as of 3Q 2015 decreased by 1.5% to USD120.29 for the whole Bali area. Likewise, in the South Bali area, the ADR was down slightly by less than 1% to USD163.05 while the highest falloff of 6.4% was experienced by most hotels in South Central Bali that brought the ADR for 3Q 2015 down to USD84.79.The amount of hotel development is increasingly high in Bali and this inevitably creates a competition among hotels. Several hotels already introduced lower rates; however, this is not representative of the general market condition although from our supply projections, competition is anticipated to heighten.although from our supply projections, competition is anticipated to heighten.hotel. The QoQ figure as of 3Q 2015 decreased by 1.5% to USD120.29 for the whole Bali area. Likewise, in the South Bali area, the ADR was down slightly by less than 1% to USD163.05 while the highest falloff of 6.4% was experienced by most hotels in South Central Bali that brought the ADR for 3Q 2015 down to USD84.79.The amount of hotel development is increasingly high in Bali and this inevitably creates a competition among hotels. Several hotels already introduced lower rates; however, this is not representative of the general market condition although from our supply projections, competition is anticipated to heighten. 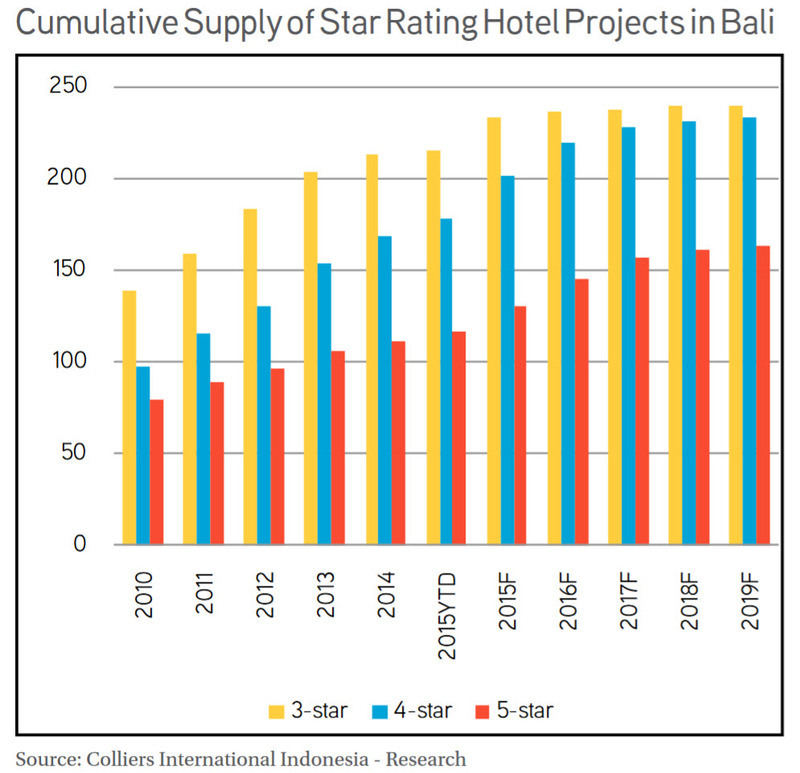 Looking at the list of hotel development in the pipeline, we can see that 4-star hotels are the most popular in the Bali area. Likewise, the number of 5-star hotels in development in Bali in the future is quite substantial. In our supply projection, there will 126 hotel projects providing 20,546 additional new rooms of star-rated hotels between 3Q 2015 and 2019. The room composition will be 19.92% or 3,075 rooms in the 3-star category; 45.61% (9,350 rooms) at 4-star hotels; and 38.84% or 8,121 rooms rated as 5-star. Early in July 2015, the eruption of Mount Raung (East Java) hit the local and surrounding area including Bali. The catastrophe had a significant impact on the Bali tourism industry because the government had to close Ngurah Rai International Airport for any flight to or from Bali for several hours on several days. As a result, at least 74,000 tourists canceled their trips to Bali. Bali is becoming a favorite destination for tourists from China with the number of tourists from this country increasing. Based on data from the Bali Provincial Tourism Office, by July 2015, the number of Chinese tourists was 489,233. This increased by 25.56% compared to the same period in 2014. 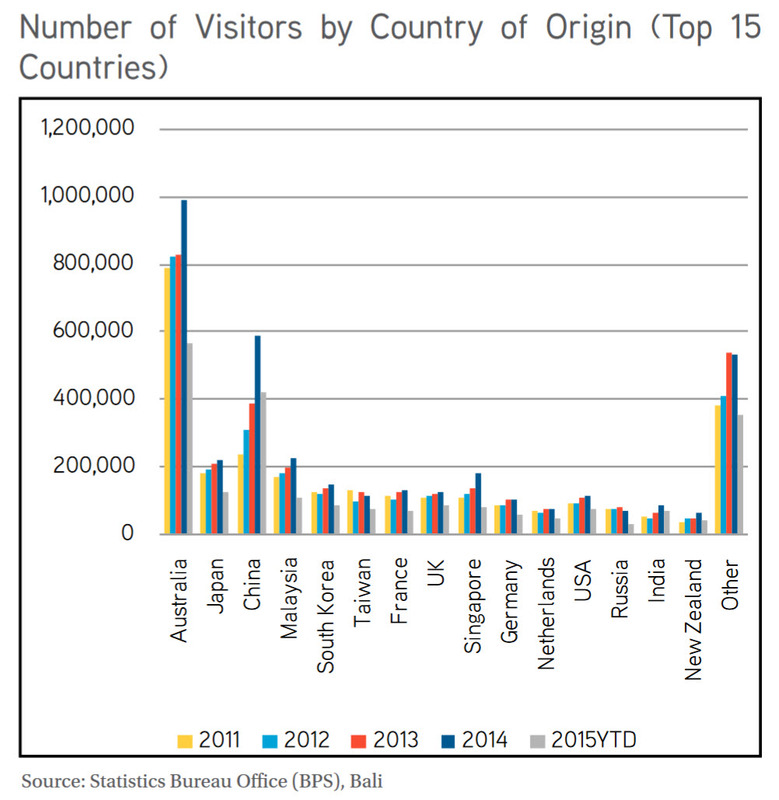 Unlike the growing number of Chinese tourists, the number of Australian tourists seems to grow slowly. By August 2015, the number of Australian tourists was 625,413 representing a 0.1% growth compared to 2014 YoY. The Bali tourism market has been predominantly propelled by the domestic market for several periods during the good and bad times. The opening of new direct flights to and from other areas helps fuel the amount of domestic tourist spending in Bali. Clearly as over development and congestion continues to plague Bali, many tourists both domestic and international are considering other options and alternatives when booking their travel and vacation destinations. As inter-Island flights are opening, more Indonesians start vacationing in domestically alternatives such as The Oasis, which offers an attractive alternative at competitive rates without compromising the quality of experience. In fact, it may represent a 5 Star Experience at Budget rates at least in the next several years, as we develop our value proposition and build our reputation as a premiere destination with 5 Star recreational activities, including a fully appointed Ayurvedic Health and Wellness Center as well as peace and serenity difficult to find elsewhere at any price. The Spread Sheet below reflects the base market assumptions for yearly income from a 100-meter plot investment with guest accommodations constructed. The Spread Sheet assumes that the daily rate is equivalent to $100 USD and that the rate of occupancy is 80% on average for the year. This day rate is very competitive within our market for our offering and the average occupancy is also in line with the numbers experienced on Bali, Lombok and the Gilis according to Colliers International Research and the statistics Bureau Office Bali (BPS) Bali all of which may be seen under the Market Data in this plan. In the 2 examples provided below projected income in shown based on the assumption that each accommodation will rent at a daily rate of 100 USD and that the occupancy rate will be 80% on average equaling 28,800 per year. Subtract the total Investment of 60,000 and the total other costs of 11044 per year for 4 years equals 44,176 and the result is $25,504 net gain after only 4 years. Partner's Investments have been returned with a net gain of 21,044 USD if our assumptions hold true. NOTE: These assumptions are in part based on previous performance as shown in Colliers International Studies and The Bali Bureau of Statistics as shown in this Business Plan. Also it should be noted that we are able to market our offer to more than 350 people daily at our restaurant as well as many of our partners are Yoga instructors with large followings who intend to use the Oasis for one of their annual retreats. We therefore are very confident that we will be able to meet or exceed the assumption of 80% average annual occupancy. The daily rate is also well within market expectations at 100 USD daily. Perks and value added promotions that combine some of our favorite activities will also play a part in keeping the Oasis full and operating at full capacity. In the above scenario, we have included an additional 10K USD in the investment to provide for the high-end accommodation package to illustrate how this stacks up over the 4 year period. Investing in this package will result in higher resale value as well as during your stays you will enjoy higher quality accommodations. These units will not command higher daily rates. was established in 2009 and has spent the past 8 plus years building one of the most loved and frequented restaurants on the Island of Bali. We are a team of seasoned entrepreneurs committed to developing great ideas and generating excellent returns for our investors. Today Clear Cafe is arguably one of the most loved and highly frequented eateries on the Island of Bali having served more than 500,000 visitors since opening our doors in 2009.